For more than 20 years, James M. Kerr has been an independent management consultant working with both large and small companies: He helped Home Depot reimagine its store operations, for example, while advising smaller firms such as specialty insurer Jewelers Mutual on how to open up new markets. Already the author of three books, Kerr’s fourth book pulls together the varied experiences and knowledge acquired in his project work into a deceptively simple but practical and comprehensive checklist for executives. 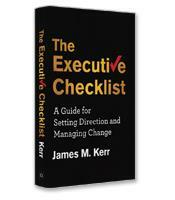 The Executive Checklist: A Guide for Setting Direction and Managing Change is built on 10 general items that all executives must manage and implement if they are to be successful: establish leadership; build trust; set strategy; engage staff; manage work as projects; renovate the business; align technology; transform staff; renew communications practices; and reimagine organizational design. With the chapters devoted to each of these items, Kerr moves from the general to specifics with sub-checklists that are focused and actionable. The checklist for establishing leadership, for example, is as follows: have a dream; actively set direction; communicate early and often; be dynamic and visibly involved; promote collaboration; practice inclusiveness; don’t tolerate bad leaders in your midst; make no excuses. In less experienced hands, a book of checklists and sub-checklists could easily turn into a litany of platitudes with little implementable substance behind them. 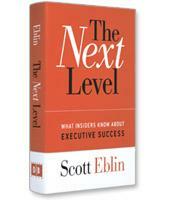 The Executive Checklist, however, reflects the grounded, real-world perspective of a management consultant paid handsomely to get results, not talk. The discussion on having a dream, for example, does not describe Martin Luther King’s speech or John Kennedy’s space goals. Instead, Kerr introduces the concept he used with LexisNexis Insurance Software division of a “vision trade show” — essentially a faux trade show with booths manned by a member of the senior leadership team. For LexisNexis, the trade show booth format had several advantages over the traditional town hall meetings often used to spread the word on a company’s vision. Each booth emphasized specific key points or themes, such as speed to market, continual transformation and the building of a talent factor. In addition, the fact that top executives manned the booths persuasively demonstrated the full commitment of top management to the new vision. Recognizing that the job of an executive is to lead and motivate others, The Executive Checklist includes actions that executives must demand of others as well as themselves. For example, Build Trust, the second of Kerr’s 10 items on his executive checklist, includes imperatives such as “model the behavior,” “share the wealth” and “keep it light.” Building trust, however, also includes “don’t play games” and “do your job” — which apply to both boss and employee. Bill Belichick, coach of the New England Patriots, doesn’t play games and does his job, but a great part of his success — he turned a franchise never known for its winning consistency into a team that, since he became coach, has appeared in more Super Bowls than any other team — comes from ensuring that his players also never play games and always do their jobs. In fact, as players go through the entrance to the New England Patriot locker room, they pass under a sign that says simply: Do Your Job. LexisNexis and the New England Patriots are just two of the many companies referenced in The Executive Checklist: an easy-to-use reference manual for executives to keep nearby for quick guidance.